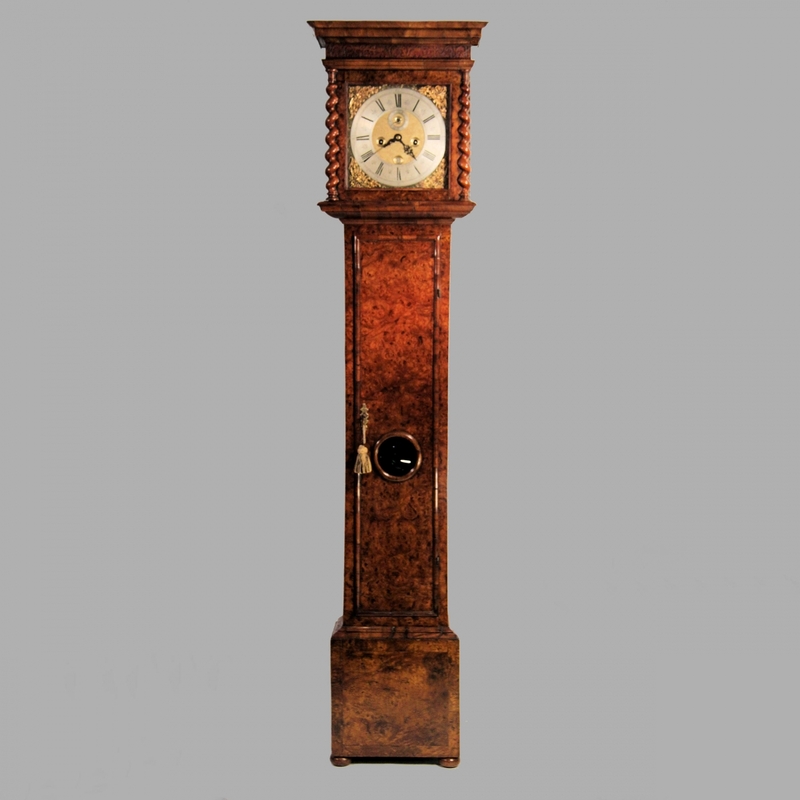 A rare clock by this good London maker. 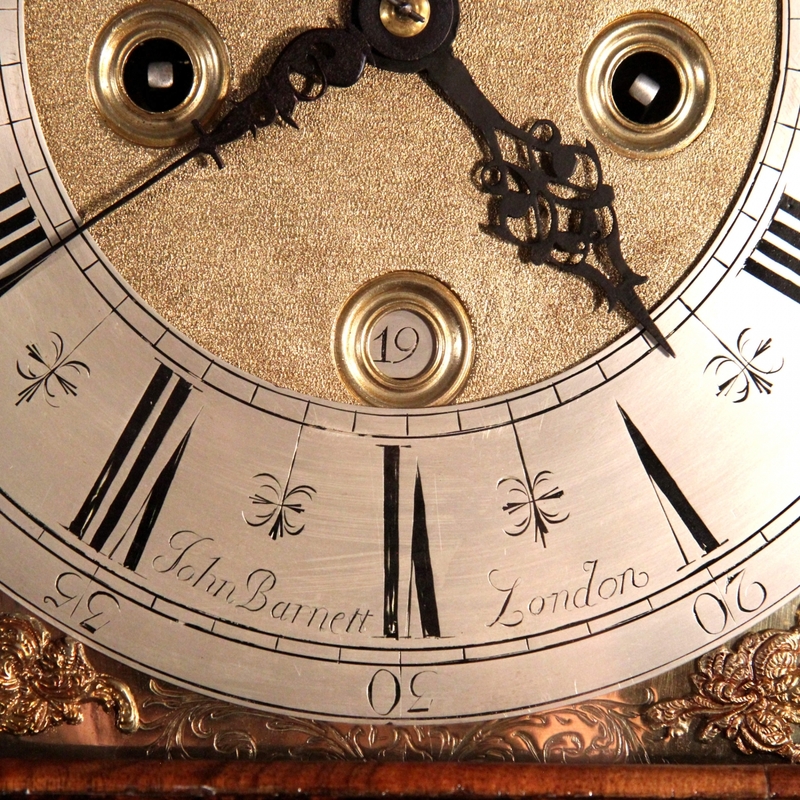 The substantial eight day duration, six finned and latched pillar movement with Anchor Recoil escapement and internal countwheel striking on a large bell. 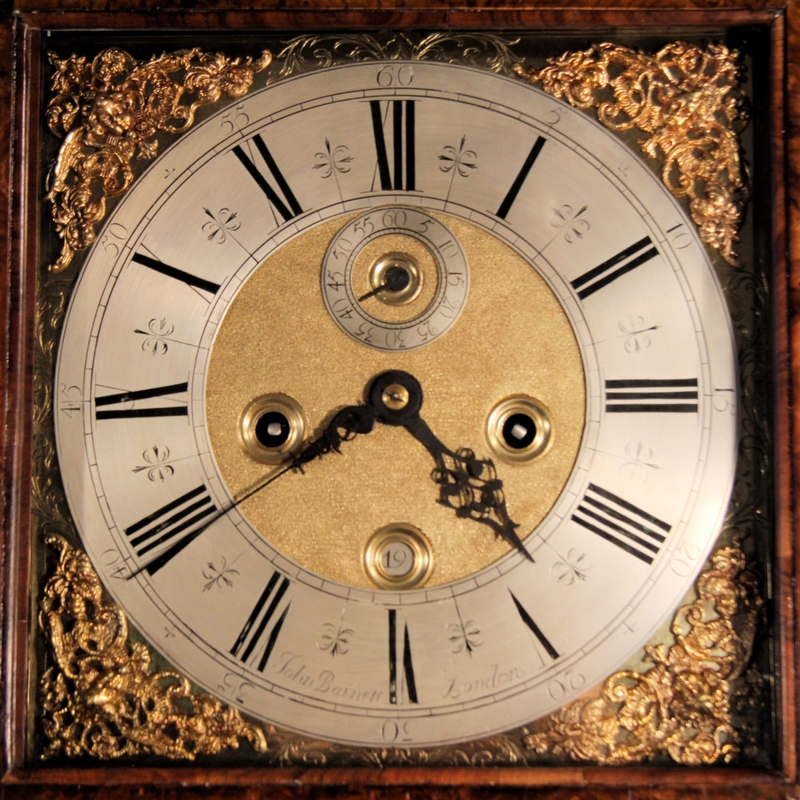 Behind an eleven inch square brass dial with silvered chapter ring, subsidiary seconds ring and calendar date ring. The chapter ring having Roman numerals within the minute ring and Arabic fives beyond it. 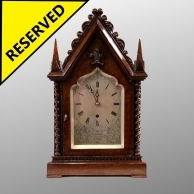 The half hour markers are of cruciform design emanating from the inner, quarter ring also, the maker's signature of "John Barnett. London" spanning the space between the V and VII numerals. The seconds ring having inner divisions and Arabic fives. 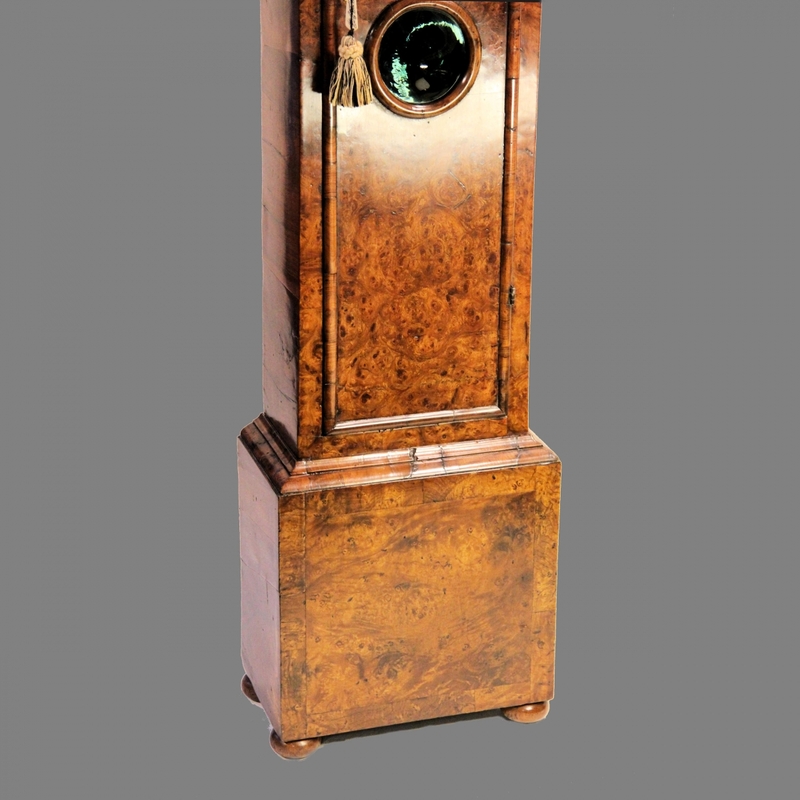 The dial has a finely matted centre with ringed winding, seconds centre and calendar apertures and the outer centre portions having symmetrical scroll engraving. Also having gilded 'Winged cherub's head' spandrels and pierced blued steel hands. Contained in a well proportioned case of excellent colour. 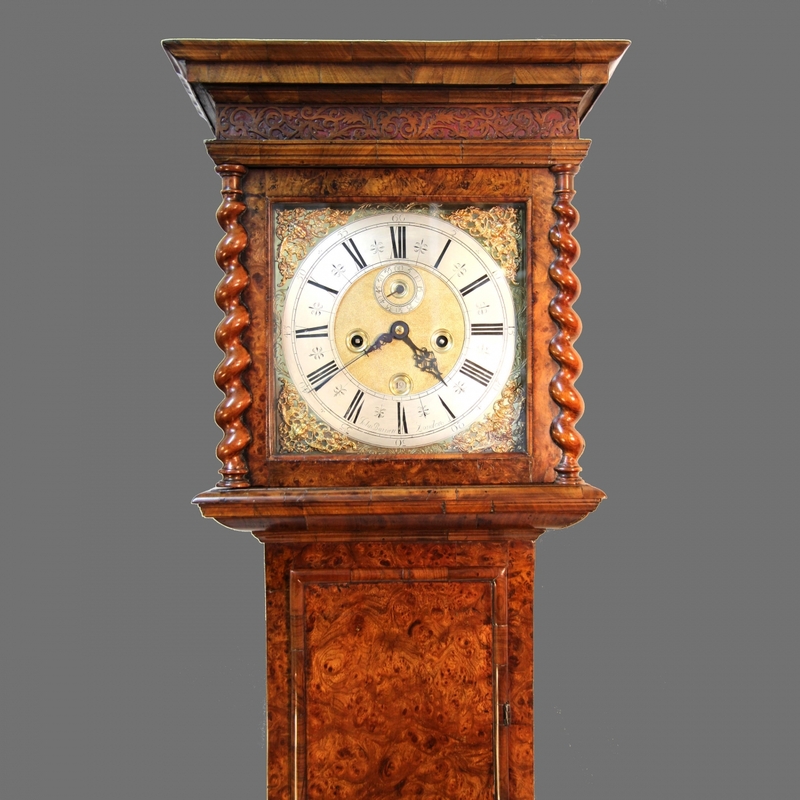 With an oak carcase veneered in walnut with burr elm veneer to the front. The sliding, typical of the period, flat hood having cross-grain moulding and 'drip ledge', short fretwork, further cross-grain moulding, barley twist pillars and side inspection glasses. 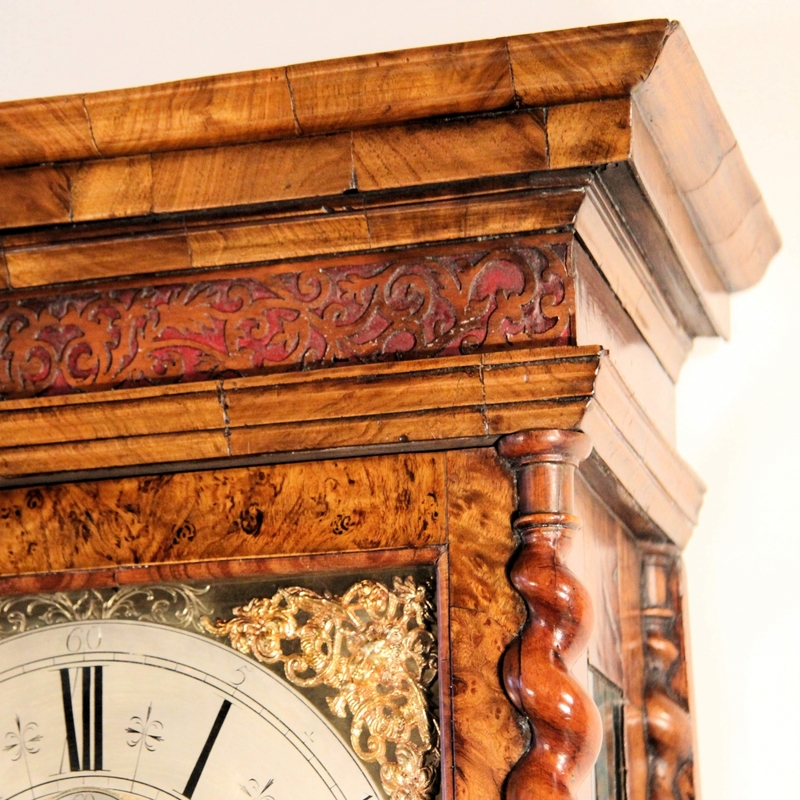 The convex throat moulding having a further lower, cross-grain moulding over the handsome trunk. 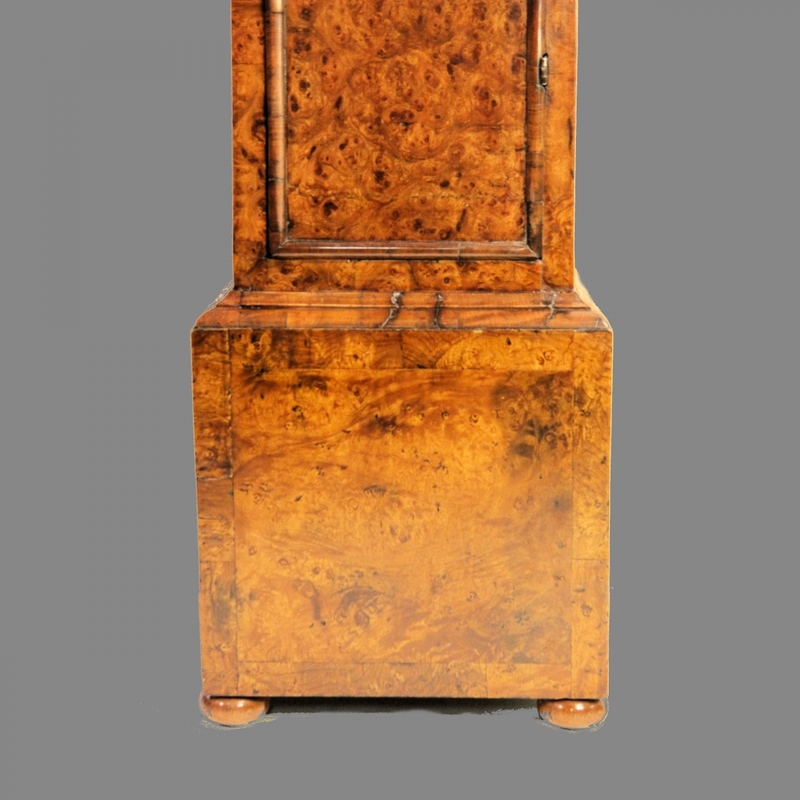 The trunk has a full-length door with circular edged, glass lenticle and half-round cross-grain edge moulding. 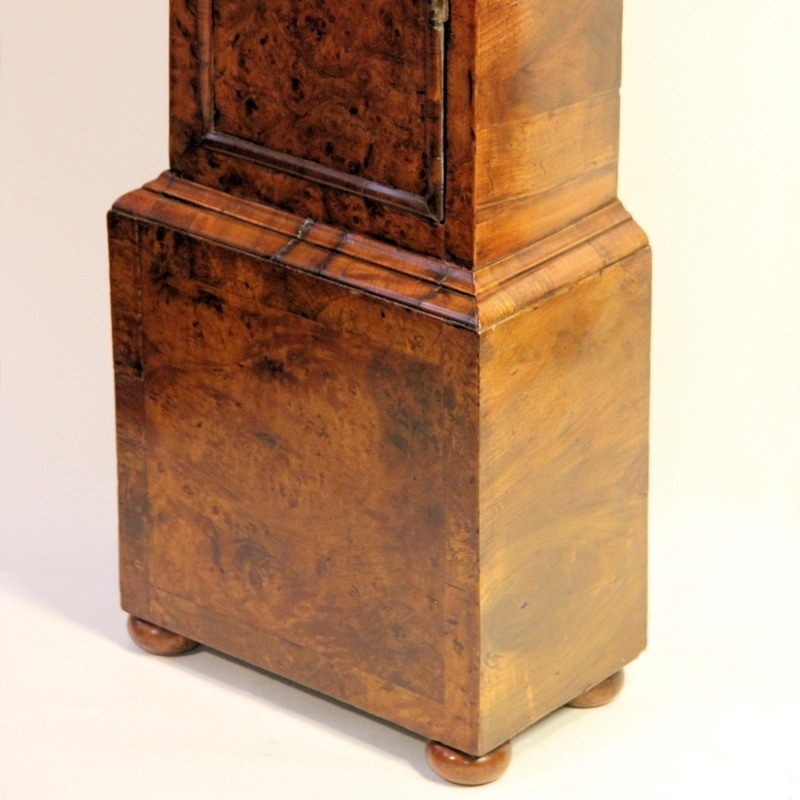 The panelled base has an elaborated top moulding and sits upon four quashed bun feet. * John Barnett is known to have been born at Sawley in Derbyshire about 1662. 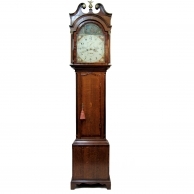 He was apprenticed through the Clockmaker's Company to John Ebsworth in 1675 and was made free in September of 1682. He lived in the parish of St. Margaret's Lothbury at the Sign of the Peacock and also at the Sign of the Dyall. He died in 1702 age 40. 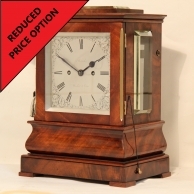 Clocks by him are considered very good and are collectable, he was successful for his young age and always produced beautiful pieces. 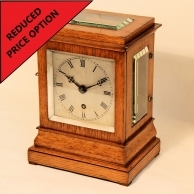 This example is in an extremely rare case and similar examples were produced by makers such as Tompion, perhaps they were friends. 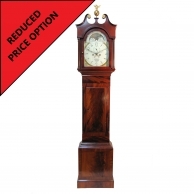 ** This clock is very original and has a fabulous appearance, the grain to the burr elm is astonishing. It is a practical, functioning work of art and aesthetically, perfect. Dimensions: 79 3/4" high x 18 3/4" wide x 10" deep. Investment forecast: 8 (it is expected to appreciate in value by 80% over the next decade).